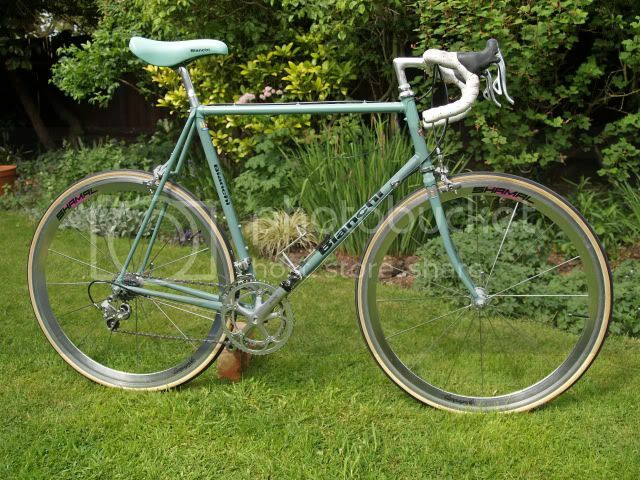 Not a major heads down racer kind of guy but the racers that have always turned my head are Bianchi's in there trade mark celeste colour. The colour rules. And the name has pedigree. They did some great steel back in the day. Not sure on that one though. What's it built from and by whom? Assume Bianchi have no builders in house any longer. The photo puts me off too, clearly no idea how to size it up, a foot of post on a standard frame looks sh*t.
Also they did the Bianchi Pista. If you want contemporary steel from italy why not look at De Rosa offerings. Or Colnago, Pegoretti etc. I can see the appeal of this sort of thing, but for the outlay of a new bianchi Id far sooner have a 'classic' merckx/colnago/pinarello. The EV2 alloy frames of about 10 years ago had a particularly poor track record as far as failure goes, which did nowt for the company's reputation. Doesn't quite work appearance-wise being built up with modern competition-standard parts; if they're going to the trouble of using 11sp Athena I'd have put a carbon fork on it myself. Edit: Having had a second look I think it's the fork crown that doesn't sit right. Should've used a cast crown not a welded unicrown if going for a steel fork (as per the De Rosa Neo Primato). Last edited by David B on Mon May 17, 2010 9:19 am, edited 1 time in total. I would prefer to see some chrome if they're really going for retro! I mean stays, dropouts, the works ! Looks good to me, apart from the Deda Murex quill stem. I love that colour and the older Bianchi typeface looks better than the modern (and would look awful with modern). For the money though you could have a home grown custom frame with a mid-range group.